FOR A SMALL country, Ireland has plenty of things to see and do to keep tourists returning to our shores. From natural wonders to cultural crowd-pleasers, most of our attractions receive an overwhelmingly positive response from visitors. But as reviews on TripAdvisor will demonstrate, sometimes people can be incredibly hard to please. Here is a compilation of some of the less kind things that tourists across the world have said about Ireland’s most popular attractions. The Guinness Storehouse was Ireland’s top fee-charging attraction during 2017, attracting over 1.7 million people last year, according to figures from Fáilte Ireland. With that many visitors, it was inevitable that some negative opinions would surface, with complaints including the price for admittance, the self-guided nature of the tour, and its lack of details about the process behind how Guinness is brewed. If you want to learn about Guinness, go to a pub. The storehouse is a tragic waste of money. There’s a good view from the bar at the top, which earns it one star. Meanwhile, JohnS from the USA said the attraction was “hands down the most boring tour I’ve done anywhere”. Brewing is just not an interesting process, at least how it’s presented here. There are no unique insights gained from the exhibitions… Total waste of time and I enjoy learning but this was dull. Ireland’s next most-popular attraction during 2017 was the Cliffs of Moher Visitor Experience, which brought in more than 1.5 million visitors, although many people complained that they were misled into paying a car-parking charge for no reason. For others such as KilbegganRanger, who left a review after passing the attraction by boat along the Clare coast, the cliffs themselves were not the problem. “I don’t recommend it to seasick prone middle-aged men on boats at all,” he said. Our over-friendly captain regaled us with the geological, botanical and cinematic history of the place and it certainly did not help with my seasickness one bit … Disneyland is far bigger and better and has taken less than a century! Be prepared as you could be in America there are so many American tourists there who were so patronising to me about my mobility issues it was unreal. Bring ear defenders as they can get very over excited too. Back in the capital, Dublin Zoo saw a 10% rise in the number of people who passed through its gates last year, taking in more than 1.2 million visitors during 2017. But not everyone was happy with what was on offer in Ireland’s third most-popular attraction last year. Many, including 1234chanw from the UK, complained about the unhappy appearance of the animals, saying they looked “sad”. I left feeling very upset. Windows to view the animals were grubby and dirty, covered in muck. Just a genuinely disturbing experience. Another high climber last year was the National Aquatic Centre in Dublin, which saw almost 1.1 million swimmers pass through its doors in 2017. My 2yr old grandaughter [sic] was terrified of the frogs and pirates in the place. After spending 15mins trying to get her in the water, we gave up and left. I recently attended the national aquatic centre with my beautiful girlfriend. The last time we were there must have been a decade ago. It is safe to assume we will not be returning. Between the snot-riddled jacuzzi and the cheese grater slides, I left with a heavy heart and an aged body. 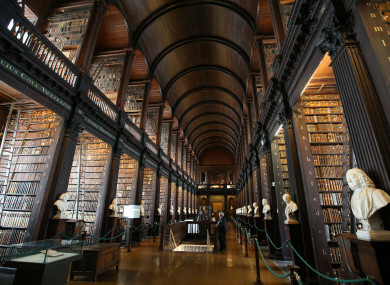 Always popular among those from foreign shores, the Book of Kells was Ireland’s fifth-most-visited attraction last year, when over 980,000 people paid to see the 9th-century book. This was horrible. Ordered tickets online and got there early for a 12:30 tour. Only after I get in do they tells us the Book of Kells is closed due to a technical issue … don’t waste your time here. Its [sic] a mob scene. Too many people in too small a space. If you want to know about the Book look it up on Google. If you must, for some reason see the real thing, ask yourself why before going through this. They have a book which was written ages ago if I wanted to read an old book id [sic] look one up online … Wasn’t happy with the lack of pints. They have tour guides who look like absolute spanners as well. Reviews of other attractions outside last year’s top 10 also showcase the outrage felt by visitors to Irish shores, including the Blarney Stone. A number of individuals who travelled to Blarney Castle – Ireland’s 12th most-popular paid attraction last year – felt the attraction was overpriced and overrated. What I hadn’t really thought about was all the other lips that had kissed this stone before me and it looked like it had been many too as it was rather slimy looking.It was to [sic] late for me to turn around and go back…my advise [sic] is take some tissues and sanitiser to wipe your lips after or better still don’t waste your time n [sic] money on this tourist attraction. Visitors to The Burren - renowned for its stony, barren features – also expressed disappointment with what was on offer at the Co Clare attraction. Dolman [sic] is worth a stop. The cave is just a cave. If you are looking for something to fill the day it works. We wasted time here. Email “'Wasn't happy with the lack of pints': Visitors complain about Ireland's most popular tourist attractions”. Feedback on “'Wasn't happy with the lack of pints': Visitors complain about Ireland's most popular tourist attractions”.